Vancouver is fraught with crises. The opioid epidemic has ended literally thousands of lives, homelessness remains an enormous issue, and the housing shortage is sending the city’s affordability into a nosedive that threatens the financial security of countless Vancouverites. This is why it’s appalling that while all of this and more plagues this city, the cops and their counterparts still manage to find time to walk into a swanky whiskey bar off of Commercial Drive to raid $40,000 worth of booze. According to the Fets Whiskey Bar owner, 242 bottles of specialty whisky were whisked off by government officials and the police because they weren’t purchased through the Liquor Distribution Branch, which all B.C. liquor licensees are required to go through when buying product. What apparently spurred the decision to conduct this raid was a complaint filed against a bar in Victoria, which eventually led to the Vancouver location. And while what Fets did was technically illegal, it hardly warranted the confiscation of hundreds of bottles of single-cask whiskey, and certainly didn’t cause direct harm to anyone buying or selling it. The local business owners and their employees, however, have now been left to count pennies and scramble to recover what was lost in the “prohibition-style” raid. That catchy phrasing, which is how the Fets described it to the press, has now sparked conversation across the province about B.C.’s archaic liquor laws the harm they cause. When you consider the seriousness of the injustices being done in our communities, the whole event seems like an excuse to go after something that can only jokingly be described as a crime. A Vancouver Sun poll that’s open online shows that the mass majority of the publication’s readers agree. If only a small sliver of the population agrees that the raid was worthwhile, it’s time for the city police and government inspectors to sit down, look at themselves in the mirror, and invest their time and energy into something smarter. 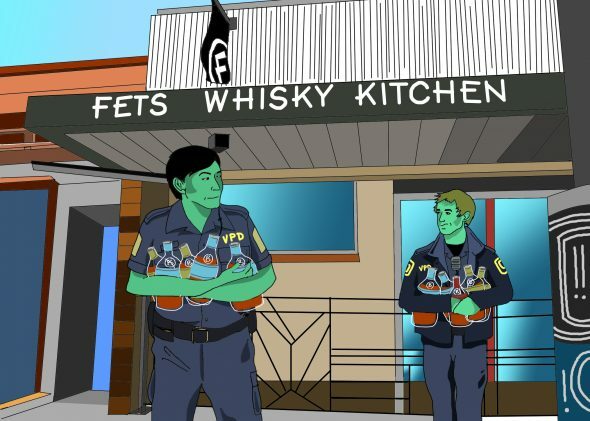 If Fets Whiskey Kitchen had been a government-run liquor store instead of a private one, it never would have been raided. The latter are able to purchase bottles of the liquor that were confiscated, but are unable to then sell that liquor to anyone else. If bottles of specialty whiskey changed hands from one liquor distributor to another—a practice that licensees commenting on this event say has been happening out in the open for years—suddenly the government is sending men in uniform to remove them from the premises. Officers on the job aren’t needed in B.C. bars that sell specialty liquors which were fairly bought and collected. They’re needed on the streets, on patrol, in consultations with the public, and in crisis situations. What the government could possibly gain from either destroying or holding hundreds of bottles of whiskey in storage—other than oh-so-heroically laying down the law—is a mystery. If this practice is really peeving off the province, authorities can give businesses like Fets a slap on the wrist or two before taking more serious punitive action. Waltzing into a local bar with no warning and the intent of conducting an undercover sting is more than just unnecessary. It’s insulting and unethical. There are other problems to be focusing on, and there are other people who really do deserve to have thousands of dollars of substances taken away from them (like B.C.’s fentanyl dealers, for instance). With the NDP liquor review currently underway, we can hope that this won’t keep happening in the future. And maybe, just maybe, we will see our law enforcement working on what this city truly needs.